The Westacres estate was created in February 1888 when the 7 acres and 4 perches field known as North East Leazes was sold by the owner of the adjacent Benwell Hill House estate, Percy Graham Westmacott, to Sir Benjamin Chapman Browne. The consideration was £6,000. 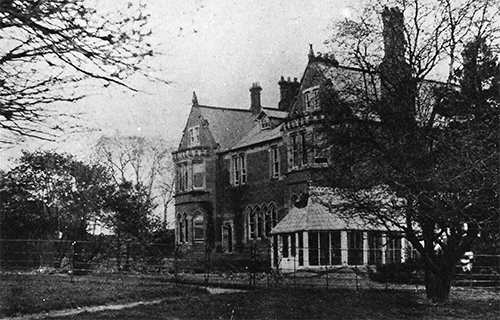 The field already contained a mansion house known as Benwell West Park which Sir Benjamin renamed Westacres. Northumberland Archives contain a letter of complaint, dated 17 July 1898, sent to James Shield, the builder of Benwell West Park, regarding damage caused by subsidence. The land concerned was 'bounded on the west and south sides by other lands of the vendor, on the north side by the Turnpike Road from Carlisle to Newcastle and on the east by the road leading from Benwell Village to the said road together with the dwelling house and other buildings thereon ... lately called and known as Benwell West Park and now called and known as Westacres'. In addition, both vendor and purchaser covenanted with each other that, until 11 November 1912, they would not use their land 'for any purpose other than residential purposes'. The house was built of red brick and stone and faced east with an ornamental garden on the western side. The grounds were well wooded with a lodge and stable block at the entrance. Sir Benjamin Chapman Browne, Lady Annie Browne and their extensive family were the only occupants of Westacres. Sir Benjamin, a solicitor and company director, died in March 1917. His widow lived on until 1929 and, after her death, the estate was sold to Harry Kindred, a local builder. He demolished the house and built the present Westacres estate, each of the 65 houses built to order, over the period 1930 to 1938. The only relics of the old estate still standing are the former gardener’s cottage at the north west corner and the stone boundary wall in Fox and Hounds Lane. The lodge stood at the entrance to the carraige drive, facing the old Fox & Hounds Inn. It was used by Mr Kindred as a site office and the former company offices stood on almost the same spot. A row of trees stood where the present block of shops, built in 1938, are situated.